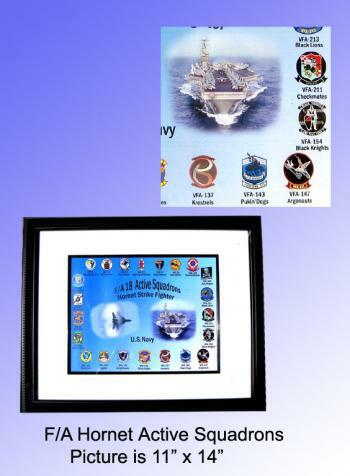 Current F18 fighter squadrons pic with frame [GIFT-030] - $129.00 : Metalcraft by Blair - military gifts and memoribilia. Saying thanks for a job well done: Or giving Mom and Dad something to be proud to hang on their wall. Picture measures 11" x 14"
Frame measures 19" x 23"